Heat is generated at a constant rate in either wall or (whichever wall is slowly changing color intensity). The object of this Demonstration is to identify the correct steady-state temperature profile in each wall. The thermal conductivity for each wall is indicated on the figure, and the contact resistance between the walls is given. The left side of wall is insulated and heat is transferred from the right side of wall to flowing air at 20 °C. 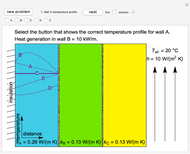 Use buttons to select the correct temperature profile for each wall in sequence; check the "hint" box for help. 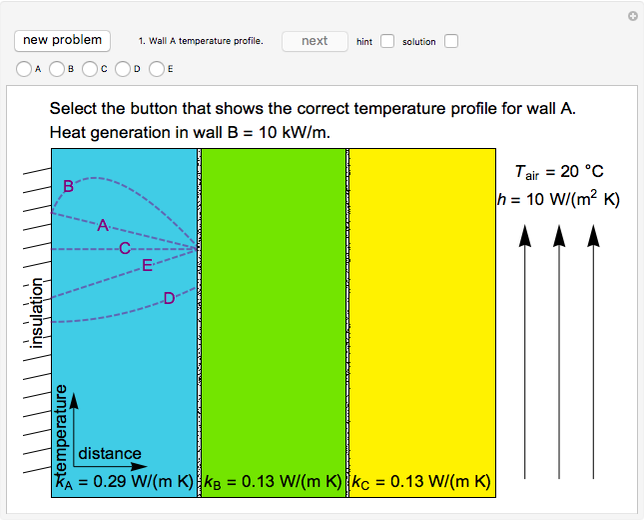 Once you select a temperature profile for a wall, you must check "solution" before clicking the "next" button; you cannot move backward. Click the "new problem" button to start over with a new set of conditions. Rachael L. Baumann and Neil Hendren "Identify Temperature Profiles for Heat Generation or Conduction through Composite Walls"